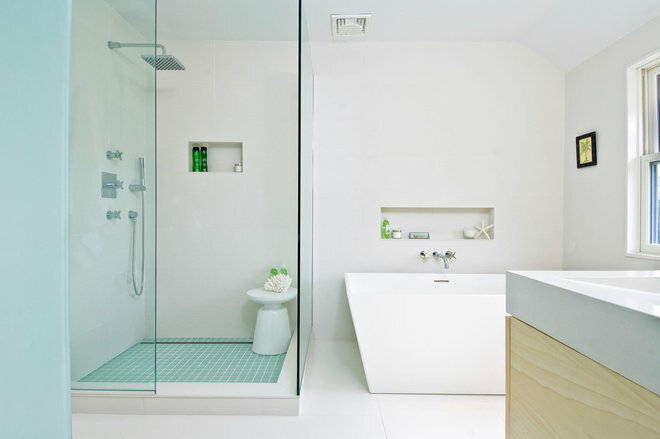 Whether you’re in the middle of a bathroom renovation or in the initial planning stages, you shouldn’t forget about your shower floor. While it may be easy to get hung up on your space’s style and color palette, it’s a detail for which function is important. Not knowing the cost, slip resistance and upkeep of what you’re buying can send your investment down the proverbial drain. To help you decide on the best option for your shower, here are six common types of shower floors at a glance. Marble is a soft stone with an even softer look. The two most popular finishes are polished (classic gloss) and honed (matte finish). The swirls of gray and cream are enough to make homeowners swoon, and its popularity isn’t going away. Pros: The biggest advantage of marble is, naturally, its beauty. It’s luxurious, elegant, timeless and romantic all at once. Marble is also surprisingly versatile. It can be made in many different shapes, from subway tile and herringbone to basket weave and standard four-by-fours. This variety is much appreciated. Cons: So it scratches. And stains. 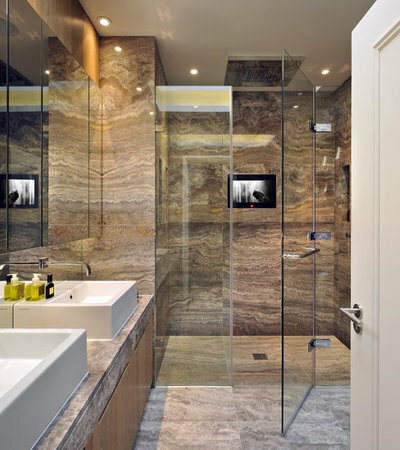 It may not seem like a big deal, but a shower space gets covered with soap and suds, which can leave a filmy substance on marble’s surface over time. A good sealer is a must. Honed marble has better scratch resistance than polished marble. In general, its slip resistance isn’t the best compared to tumbled travertine or porcelain tile. 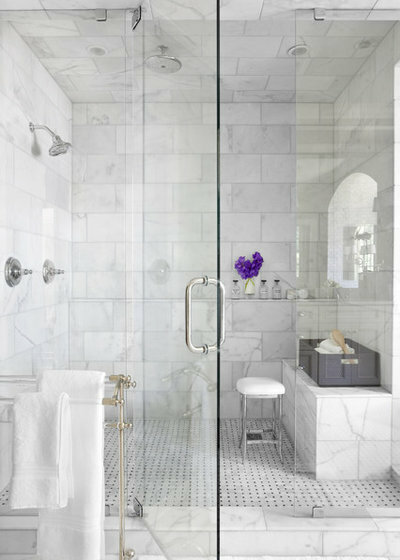 Marble can also hike up your shower’s price tag. The many shapes and styles of marble allow you to create brilliant texture-on-texture contrast. This traditional shower space complements the brick wall tile with a basket-weave-patterned floor, which adds subtle contrast to the design. It’s hard not to find a style of travertine you love, whether it’s chiseled, honed, polished or tumbled. This natural stone has the best of earth’s creams, browns, grays and golds packaged into designer tiles that grace homes across the world. Pros: Home buyers love travertine, and not just because of its veins and swirls. They also appreciate the slip resistance it offers, particularly that of tumbled travertine, as well as how long it lasts. Cons: Travertine is porous, so you could find yourself in hot water if you forget to seal it. It is recommended that you seal it every one to two years unless your sealer lasts longer. Other than that, your main concern is staining. Anything other than a mild detergent can affect the stone’s surface. Be careful how you clean it and be careful of the soaps and shampoos you use. 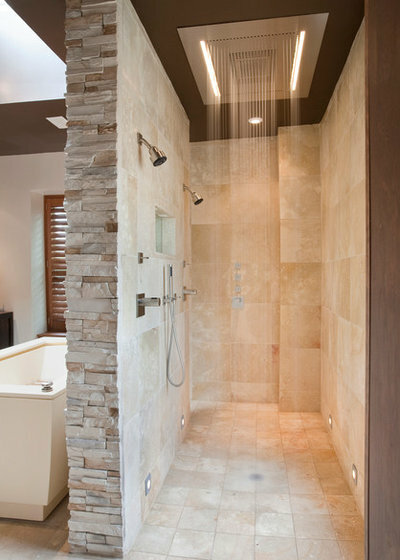 You can install travertine on your shower floors in a variety of sizes, including (but certainly not limited to) standard 12-by-12-inch tiles, 4-by-4-inch squares and 2-by-2-inch mosaics. 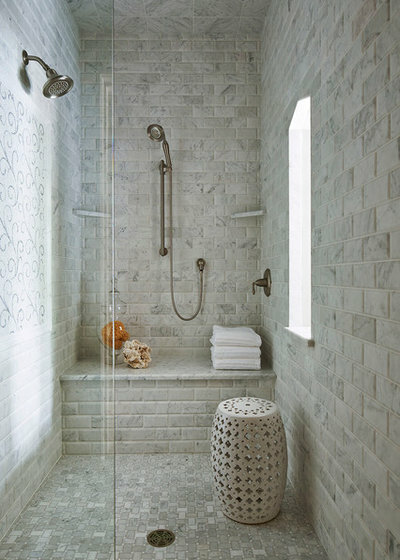 This traditional shower has 4-by-4-inch travertine tiles on its floor and walls, which create depth and intrigue. Cool, clean and contemporary, glass mosaics can insert a pop of color or stroke of glossy white on your shower floor. Pros: Looking for low maintenance? Glass may be the floor for you. It’s super easy to clean. Just grab Windex and a cloth to give it a quick wipe-down. Its translucent surface can keep your shower space light and open. It almost always looks high-end, no matter what you actually paid for it. Cons: The price isn’t always right. Quality glass can take a toll on your wallet. And unfortunately, it feels as sleek as it looks. The slip resistance is minimal, which could be a deal-breaker. 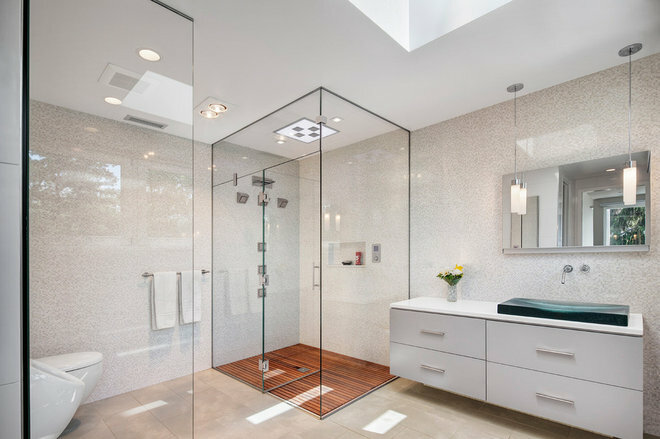 Older or very cautious homeowners should seek something with a better grip if they’re set on a glass shower floor. Glass mosaics can blend colors together with an iridescent, glossy or matte finish. 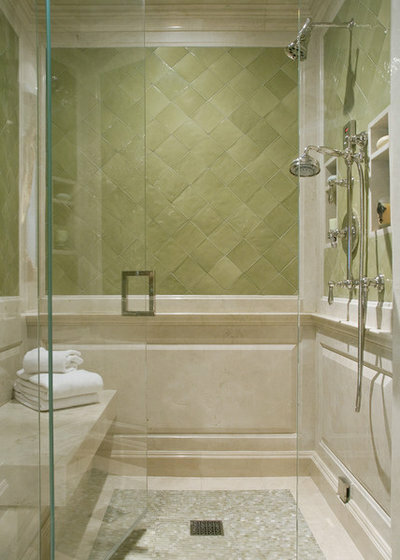 The mosaic in this Mediterranean shower gives the space a designer touch by complementing the soft green wall tile. Now here’s a shower floor that just might have it all. Made with a dense clay body, porcelain tile is durable and waterproof, and lasts for decades. Pros: Porcelain tile is highly versatile. It can survive detergents, scratches and long-term water exposure. It can be finished to have an authentic wood, stone or marble appearance. The best part? It accomplishes all of this without being high-maintenance. Expect to enjoy cleaning it (or the lack of cleaning, rather). Cons: Grout can be a problem. Rectified porcelain can keep grout joints small, but grout will no doubt be there for you to clean. It can get slick if it doesn’t have a textured surface. Wood can bring warmth and exquisite style to your shower floors. 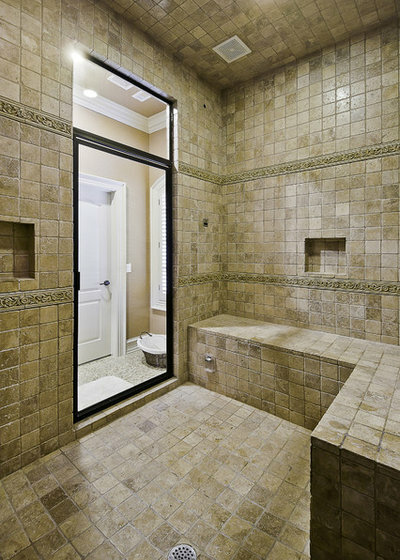 It also lets homeowners create a flat, smooth shower entry. 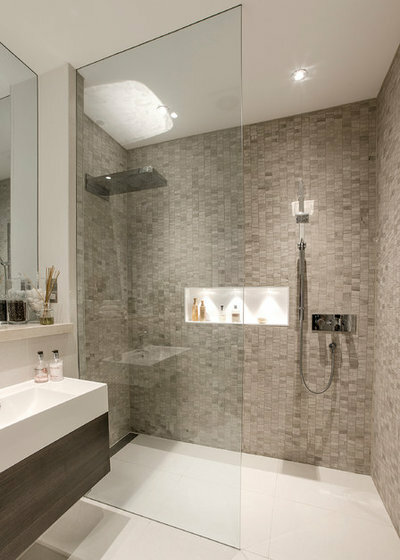 Pros: Wooden shower floors have a sleek, minimalist look perfect for contemporary shower spaces. They sit slightly above your shower base and have slats, which allow for good draining when they’re installed correctly. Moisture is less likely to fester. Wood also wears well if you maintain it (make sure you follow maintenance instructions regarding how to seal it). Cons: We all know about wood and water. Long-term exposure to moisture can cause wood to warp, discolor and fade. You won’t have direct access to your shower drain either. Your drain can get icky in the long run. Not surprisingly, wood can be costly. 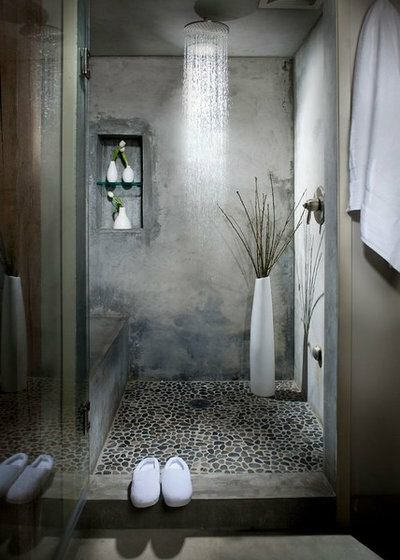 With a soothing touch and an organic look, pebbles can make any bathing experience feel refreshing. Pros: The texture of pebbles offers sufficient slip resistance because of the grip it provides to your feet. They have fairly broad appeal to home buyers. Just as with other natural stones, you can’t beat their one-of-a-kind beauty. And, truthfully, there might not be an easier way to incorporate a piece of the spa into your bathroom. Cons: There’s a lot of grout to clean, and it’s a large part of your floor’s aesthetics. While slipping isn’t a concern, the hard, rocky surface is. It can hurt your feet and be difficult to stand on while you’re showering. In areas with hard water, a chalky film can develop on the surface of pebbles, which will require daily maintenance. Flat-surface pebbles are a viable solution if you’re keen on the look but are worried about how regular pebbles will feel on your feet, though you’ll still have to clean the grout.